Despite recent rhetoric against the fastest-growing religion in the world, Islam has contributed a great deal to the U.S., including in the military, Defense Department figures show. Here's what the numbers tell us. There are 5,896 self-identified Muslims currently serving in the military, according to the Department of Defense. This is out of a total of 1,313,940 active-duty and 826,106 guard and reserve members, respectively. The Department of Defense offers service members the opportunity to identify their faith for inclusion in the Dependent Eligibility Enrollment System, and on their identification tags. If you're wondering why -- it's for a very practical reason: for burial practices and religious services in the event of death. 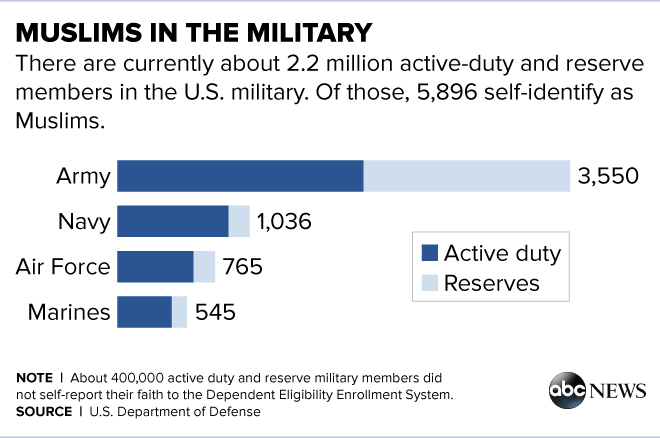 It's important to note that of the 2.2 million in uniform, active or reserve, 400,000 service members have not self-reported their faith. So the total number of Muslims currently serving in the U.S. military is likely higher.